In an attempt to try and legitimise their business, it’s becoming increasingly common to find these people attaching themselves to interfaith events for peace, or political actions that include a spiritual element. Although the labels may have changed, what they are doing is no less immoral, damaging, or offensive to our traditional ways and the people they are taking advantage of in the process. Giving them a platform risks undermining the aims and message of the events they are attaching themselves to. If you are organising an event and find someone who does any of the following, you can be certain that they are not genuine. They start ceremonial fires with metal. They bring edged weapons or firearms into the ceremonial space. 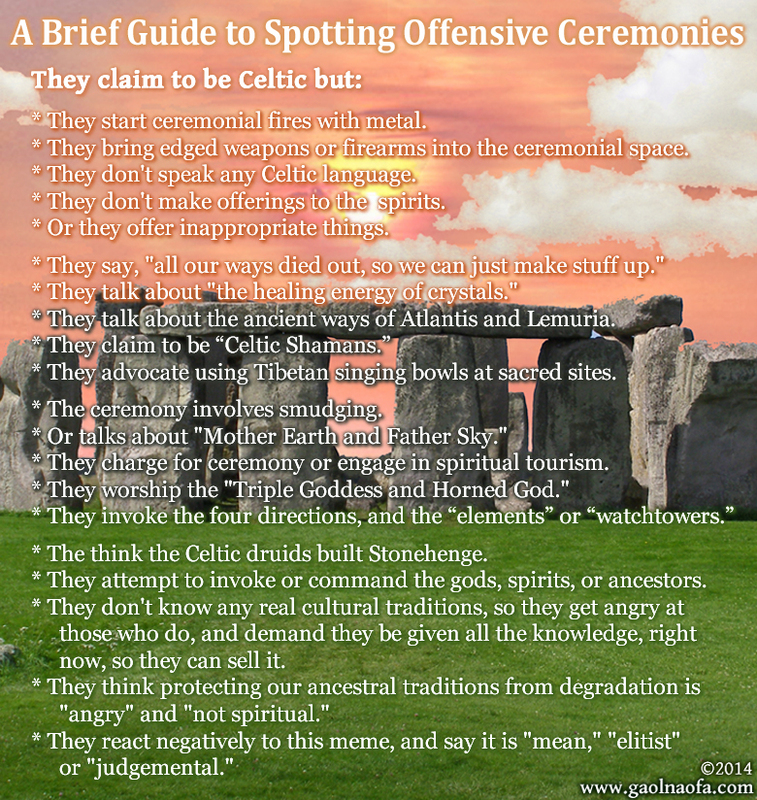 They don’t speak any Celtic language. They don’t make offerings to the spirits. Or they offer inappropriate things. They talk about the ancient ways of Atlantis and Lemuria. 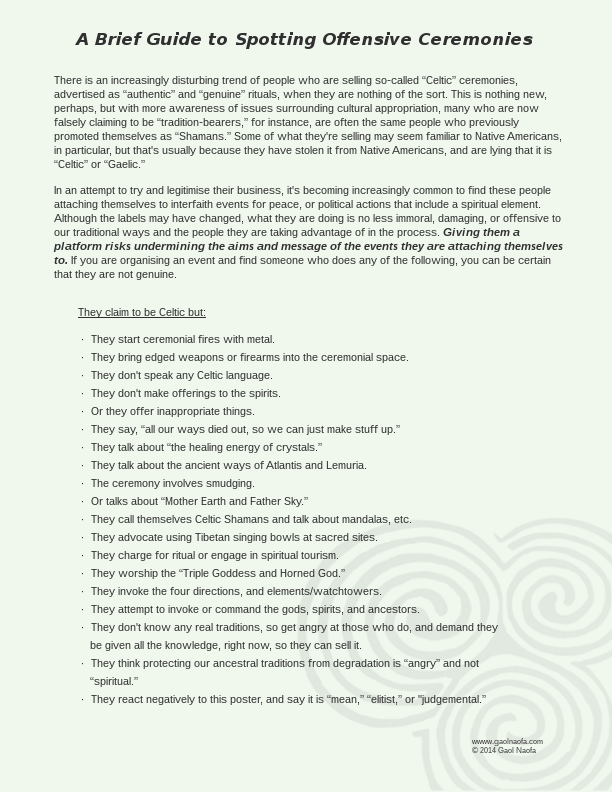 They call themselves Celtic Shamans and talk about mandalas, etc. They advocate using Tibetan singing bowls at sacred sites. They charge for ritual or engage in spiritual tourism. They invoke the four directions, and elements/watchtowers. They attempt to invoke or command the gods, spirits, and ancestors. 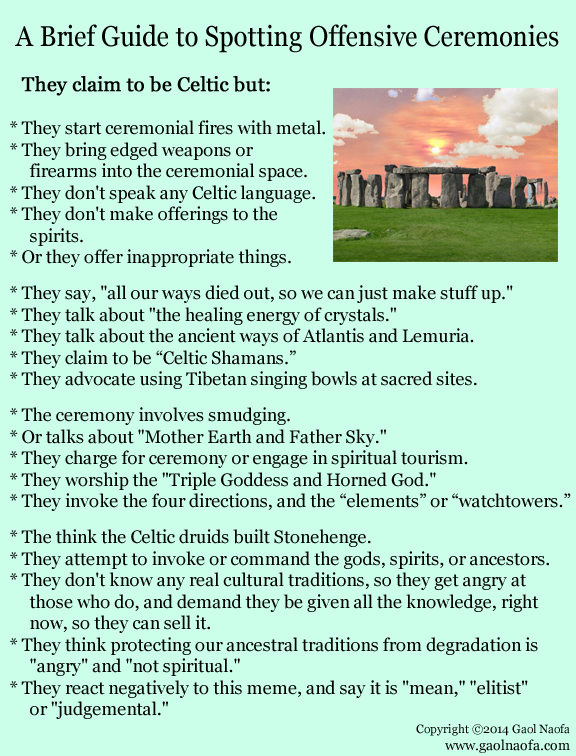 They don’t know any real traditions, so get angry at those who do, and demand they be given all the knowledge, right now, so they can sell it. You are welcome to download and distribute the following images and PDFs. The first two images are more suitable for sharing online, the third image is also available to download in PDF formats if you would like to print the information off and hand out on leaflets. There is a PDF version for both US and UK A4 sized paper. Note – PDF files, while good for creating accurate printouts, do not preview well on all devices. Mobile devices in particular may show these files with the triple spiral too dark, or missing completely. We have tested them and they print out fine, no matter how they preview in various browsers. When you print them out, they should look like the image to the left. If they do not look right, please contact us and we’ll see what we can do.